SMA miniature strain gage conditioning amplifier is ideal for applications where signal conditioning is needed and space is limited. 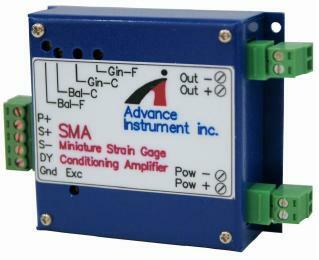 SMA is designed for the high accuracy strain measurement. Each module is designed with max frequency response is at 10 kHz. The application examples for the measuring strain gage type transducer are for the temperature, accelerator, load cell, micro-displacement, torque and pressure transducers.